Question: I would like to buy a home weather station for my father as a gift, he is always looking at the weather for his plants. 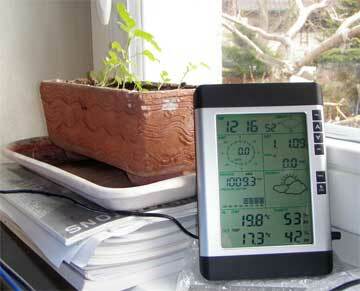 Answer: Angela, home weather stations make a great gift, especially for avid plant lovers. The most popular brands of personal weather stations are: Oregon Scientific, La Crosse, Honeywell, and Davis. A quick glance at the digital display (as most are) will quickly bring you to their mind. A weather station allows them to track, stay up to date on the current weather status of not only temperature, but wind speed, wind direction, humidity and rain fall – depending on the type of weather station. 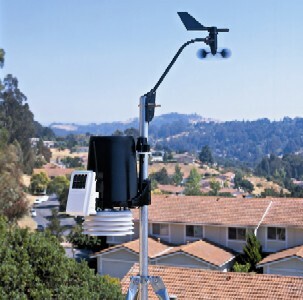 An in-house weather collection station can give valuable data and provide crucial information concerning approaching bad weather. Knowing the weather and what is coming is a big component needed to help maintain the vegetable or flower garden, home greenhouse, fish pond or aviary, along with helping to decide on the clothes to wear outdoors. Best of all, your own personal weather station gives you a painless way of learning more about and understanding the weather that affects you and your plants, and what drives it. Weather plays such an important part in our everyday life, our hobbies, sports and recreation. Home weather stations are usually very compact but high tech tools, complete with measuring sensors and devices. Most units or kits come with sophisticated software which can read, evaluate and output reports on the current weather conditions in your local area as well as forecast both short range and longer range weather conditions based on the data collected. Today’s modern home weather stations collect all this data through one or more sensors measuring temperature, humidity, air pressure, rainfall, wind speed and direction from around your home. This raw data is transferred wirelessly or by connected cables to a receiver/display console located inside your home office or somewhere else indoors and updated frequently. The unit cost increases with the more features and number of sensors used. It seems everything today is going wireless and weather stations are no different. Older weather stations made for home use, sent data along thin cables. A wireless unit using radio frequency transmits weather data effectively from ranges of 330 feet or more. No more wires, no holes in the roof or wall. Up to date weather reports and current conditions are available whenever and wherever you want. Another feature with wireless models allows the ability to be more portable with your weather gathering. With no wires to worry about tracking the temperature at ground level and in 3 different places is as simple as placing a sensor where you want it. The biggest issue may come down to the selection process, with so may models available. Along with the quantity of sensors a weather station may have, some models store historic data, come with display graphs and touch screen monitors. Some even have an alarm which goes off when specific criteria is reached like when a temperature gets too high or low. With multiple sensors and the units ability to handle multiple inputs, a home weather station could even provide the current soil temperature to help guide spring or fall plantings or let you know the temperature of the pool water before you take a dip. On the market today you will find many different weather stations from a range of manufacturers available for home use. One industry leader is from Davis Instruments and they manufacture several high-performance models of Davis weather station units for home use. Davis has been established since 1963 and lead the way with innovation and technological advances. With all the different models along with all the array of functions available, unless you are only looking for a simple way to check the outside temperature it is best to stay with the specialist in the market. Davis was mentioned above but also check out La Crosse Technology and Oregon Scientific all 3 will provide the best long term value. Davis, Oregon and La Crosse are all well represented, however the Davis’s Vantage Pro2 units provide more powerful radio transmitters, and better shielding of sensors from direct sunlight, reducing potential errors with temperature records. Accuracy, Resolution and Range all play a part in the deciding factors in selecting any home weather stations. Wireless stations list their maximum range using “unobstructed” or “line of sight” rating. This range is reduced by the type and number of building materials the signal must pass through. When installing any weather station at home review the location and your needs as well. Take into account distance from the indoor console to where the sensors will be located.